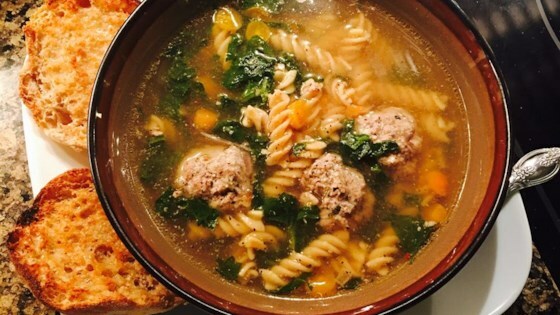 "This hearty soup was inspired by a soup I tasted at an Italian wedding. It is sure to please just about everyone! Serve hot with Parmesan cheese sprinkled on top." In a medium bowl, combine the beef, egg, bread crumbs, cheese, basil and onion. Shape mixture into 3/4-inch balls and set aside. In a large stockpot heat chicken broth to boiling; stir in the spinach, pasta, carrot and meatballs. Return to boil; reduce heat to medium. Cook, stirring frequently, at a slow boil for 10 minutes or until pasta is al dente, and meatballs are no longer pink inside. Serve hot with Parmesan cheese sprinkled on top. It would be better if the meatballs were cooked first. Otherwise it makes the soup too greasy. We absolutely loved this! I added a little garlic powder when making the meatballs and used frozen chopped spinach. It's a meal in one bowl--just add some bread.